If a smart sounding person has stepped onto a dimly lit stage and started to wax poetic about some seemingly lofty accomplishment or idea, you're probably in the midst of a TED talk. Don't panic. Stay calm, sit still, and listen. What you hear might just change the way you think. Some people already thrive on a diet of regularly delivered mental floss, preferring to watch content that actually leaves them feeling better after binge watching a few clips. The latest version of the Android app will make this exercise easier to perform. 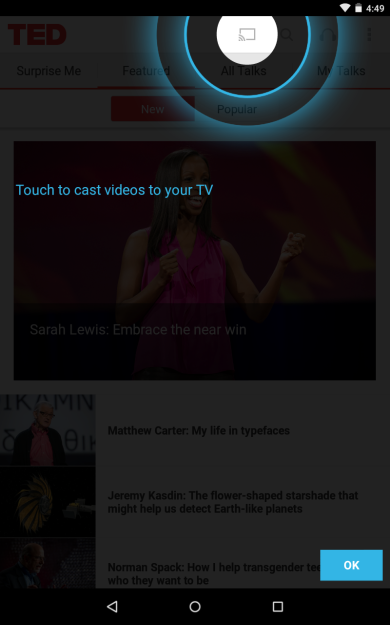 Viewers can now cast talks to their TVs without having to search through YouTube thanks to new Chromecast support. 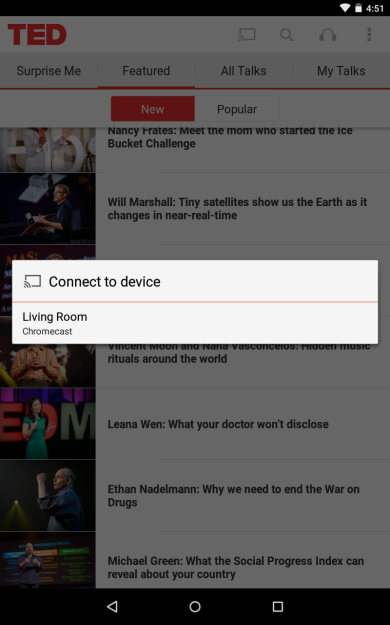 That's all the changelog contains, so if you don't have a Chromecast, well, keep using the app as usual. As you've already discovered, the short format of these videos makes them well-suited for mobile devices.